These captains did not get where they are today by being eejits. They’ve climbed the ladder of respect, and they pull fellow cyclists up, step by step. How do we judge a “good” cycling club? There are many ways of doing just that, and many answers to the question. It depends on what “good” cycling means, and that’s so different for everyone. One important aspect of good cycling is that there needs to be a structure in place, providing enjoyable activity for as wide as possible a cross-section of club members. In this regard, Dungarvan Cycling Club is tops. add your own reasons here. All Facebook comments accompanying this post will be edited in, provided they conform to Burkes Biking Profanity Policy. To this list, I want to add one further item. I rarely upgrade (definitely no wine previous 48 hours) but like to downgrade, simply to cycle with different people. In addition to my comment about the great structure within our club, most will agree that all our cyclists are just nice people, out to enjoy the bike and all that brings with it. Enjoying the refreshments outside Mace Lismore. They know all about biker-bench-syndrome. To be sure, I’ll be joining them again. They all enjoy their cycling, and “have the craic” along the way. In Mallorca, its not cricket to leave your helmet on the table. Best just keep it on your head? I sometimes use a nifty add-on to my cycling technology called RELIVE. It gives a birds eye view of the route, collected by the DCC drone in the sky. If you zoom in very closely, you will see the helmets on the table! While G23 headed west, my Group 3 went t’other way, and despite my absence, the rolling reporter reported back to me, just to let me know what I was missing. Reading back through some of the recent Sunday Spin reports, it’s very clear to me that several important things are being done correctly in order to ensure that things run smoothly. First and foremost is that each group has a leader on the road. These captains did not get where they are today by being eejits. They’ve climbed the ladder of respect, and they pull fellow cyclists up, step by step. Equally, each group has a card-carrying journalist in their midst, watching and listening for worthwhile gaffes along the way! If you prefer not be mentioned in these insightful summaries, please cycle at the back at all times, and keep your mouth firmly dúnta. Finally, unrelated to cycling, this gave me a great laugh during the week. What to you call a sheep with no legs? Answer: A cloud! Do feel free to follow the blog on Twitter and/or Instagram @burkesbiking. I hear that the Twitters are losing money, and are letting lots of employees go. However, @burkesbiking goes on. Better still, might you like to LIKE the Burkes Biking Blog on Facebook to receive updated posts? In the words of Mrs. Doyle: Go on, go on, go on. All LIKERS will be entered for a grand draw. First prize is a week in Aglish. Second, is two weeks in Aglish. 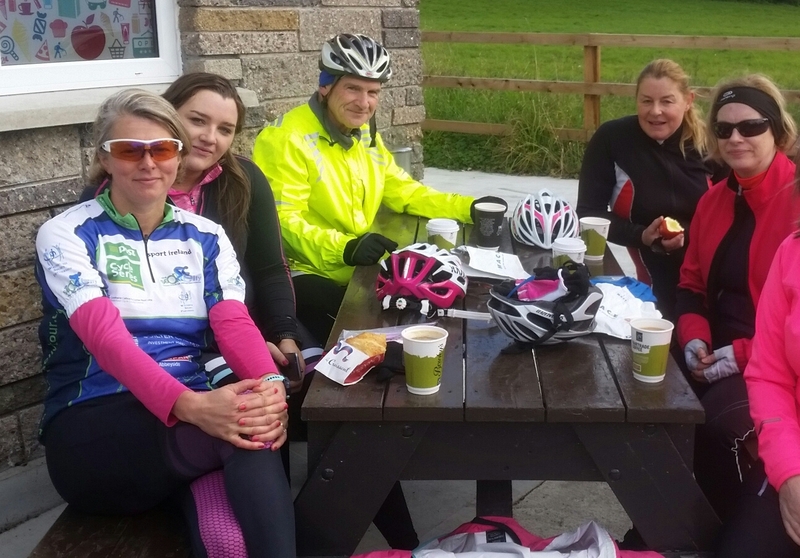 Sat Club Spin: Ride with the ‘Friends of Frankenstein’ departing Kilrush at 9am. Lismore , Knockanore, Youghal Bridge, Geosh , Mountstuart, Kielys X, Old Parish. A spin for all!. 90 km avg 26 /28. G5: ‘Trick or Treat’ with group 5 to the Welcome Inn, Villierstown, Cappoquin, Lismore (coffee), Cappoquin home main road 50km. New people Welcome Inn, Kilmolash, Capppoquin, Lismore. Spin is at a very steady pace nobody left behind. All welcome. Until next week, safe cycling out there.